Although far removed from the battles in the early years of the Civil War, Roswell played a significant role in the fight for Southern Independence. Her factories received large military contracts throughout the war, and their production was so essential to the Confederate Army that most of the male employees were exempt from conscription. The Roswell cotton mills manufactured sheeting, tent cloth and rope, while the Ivy Woolen Mill produced a fine woolen grey-colored cloth used for making uniforms. Many Confederate soldiers marched off to war in "Roswell Grey." In May 1864, three Union armies, some 100,000 men, under the leadership of Major General William T. Sherman began moving south from Chattanooga, TN. 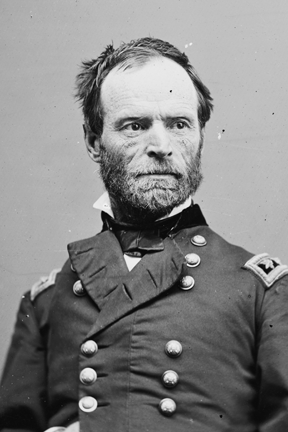 They were under orders to attack the Confederate army in Georgia, “break it up and go into the interior of the enemy’s country as far as you can go, inflicting all the damage you can upon their resources.” Opposing Sherman was General Joseph E. Johnston and his 65,000 man army. Sherman’s first objective; the vital railroad and war manufacturing center of Atlanta. Knowing that a direct assault on these Confederate defenses would be too costly, Sherman made plans for another flank attack. As part of this movement, he sent General Kenner Garrard and his 4000 cavalry troops east to Roswell. This flanking column on the Union left was to secure possession of the factories and capture the important bridge and ford at that point. Most of Roswell’s citizens of wealth had fled to safer parts and their grand homes stood silent. But the women and children who worked in the mills remained in Roswell with a few men, most too young, too old or too sick to fight. Olney Eldredge, superintendent of the cotton mill, was ordered to run the factories until driven out by the enemy. The Roswell Battalion, a local defense unit made up largely of mill workers, had been called out, three hours before the arrival of the blue clad troops, leaving only a small detachment of cavalry behind to guard the Roswell Road. Confederate troopers collided with the advance guard of Garrard's cavalrymen just outside of town. Overwhelmed and outnumbered, the Confederates raced through Roswell and over the covered bridge but not before setting it ablaze. With the bridge in flames, General Garrard turned his attention to the mills. A French flag was flying over the woolen mill in a futile attempt to save it from destruction. An inspection of the mill determined that it was, in point of fact, supplying goods to the Confederate army. Angered by the false claim of neutrality, Garrard ordered the burning of all three mills. After the mills were burned, Garrard sent a lengthy dispatch to Sherman detailing the destruction of the mills. The burning of factories and textile mills was not unusual during the Atlanta Campaign, but the situation at Roswell would be unique for the destruction of property would normally have ended the matter. But Sherman's subsequent orders extended far beyond the destruction of property and shocked many people, north and south. Sherman immediately forwarded a letter of approval giving Garrard further instructions. is right and meets my entire approval, and to make the matter complete you will arrest the owners and employees and send them, under guard, charged with treason to Marietta, and I will see as to any man in America hoisting the French flag and then devoting his labor and capital in supplying armies in open hostility to the Government and claiming the benefit of his neutral flag. Should you, under the impulse of anger, natural at contemplating such perfidy, hang the wretch, I approve the act beforehand...I repeat my orders that you arrest all people, male and female, connected with those factories, no matter what the clamor, and let them foot it, under guard, to Marietta, whence I will send them by cars to the North...THE POOR WOMEN WILL MAKE A HOWL. Let them take along their children and clothing, providing they have the means of hauling, or you can spare them. The women and children were given a short time to gather their belongings and then marched out to the town square where they waited for supply wagons to transport them to Marietta. On their arrival, the workers were confined in the Georgia Military Institute, which was now in the hands of Federal forces. Olney Eldredge with son Judson. A mill superintendent, Olney was sent north with his children.